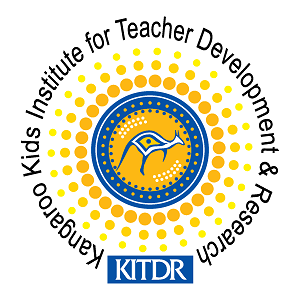 KITDR or Kangaroo Kids Institute for Teacher Development and Research is an endeavour to skill India and a build a nation of qualified, committed and world class nursery and pre primary teachers through comprehensive well-designed teacher training courses that are based on the philosophy that education is a once in a lifetime opportunity in the lives of children, and that dedicated and well-trained teachers hold the key to unlocking children’s hearts, minds and potential to infinite possibilities. Established by KKEL in 2004, KITDR’s main goal was to bridge the gap felt by trainee and aspiring teachers and educators between the content offered in regular nursery and pre primary teacher training courses in India and the demands and challenges of a real - life classroom, and to also impart high quality and intensive teacher training programmes that would be on par with the standards followed at international levels. To provide high quality programmes for all those interested in nursery & pre primary teacher training courses in India. To prepare an aspiring teacher for a career as a professional teacher. To provide up-to-date programmes that equip an aspiring teacher with up-to-date knowledge and skills they require to progress in an educational environment. To harness the potential of its all our teacher-students and to prepare them to face and deal with the challenges of being teachers in a dynamic, global, technology-based and competitive educational environment. To develop confident and committed teachers who would be role models and can prepare and mould children to handle complex situations in different contexts. To help the aspiring teachers build a stimulating, satisfying and successful career in early years education. To develop not just teachers, but leaders, innovators, thinkers, giants and game changers in the field of education. To offer unique path-breaking concepts like learner – centric approaches, a research based curriculum and practical application of knowledge assimilated and backed by international standards and processes. KITDR has successfully met all its goals in the last decade and a half and today, KITDR is recognised as one of the most successful and reputed names when it comes to institutes that offer nursery & pre primary teacher training courses in India. KITDR has also been able to offer high quality and professional training to all our student-teachers and many of them have found employment in reputed and premier schools across India. The entry qualification required by KITDR for a Masters in Human Development / Child Development is a minimum 5 years of experience in preschool setups. KITDR offers personalized attention to all aspiring teachers and there is 1 trainer for every 15 students in all our KITDR centres so that all our student-teachers receive individual attention. As of today, KITDR has 7 well-equipped centres across 4 cities in India. They are all well-located and have faculty that are proficient with the best nursery & pre primary teacher training courses and programmes you can find in India.